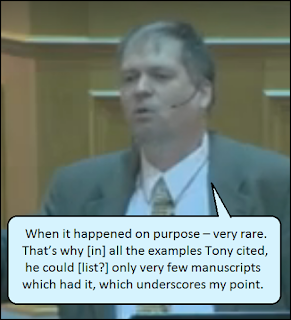 At the outset of the second part of the Tors-Costa debate about how the original text of the New Testament should be reconstructed, technical difficulties caused Tony Costa’s voice to be briefly inaudible. When the sound resumed, he was addressing Tors’ claim that the Alexandrian Text has an error in Mark 1:2, where the main part of the quotation is from Malachi. (Tors has argued in an online essay that although evangelical apologists argue that it was not unusual to blend separate quotations and attribute them to a single source, the evidence for the existence of such a custom is extremely elusive.) Let’s resume there. Once again, I will summarize the debaters’ statements and offer comment in italics. (Which is forceful – but wrong. In the Byzantine Text, where Matthew 6:11 has δὸς, Luke 11:3 has δίδου. Where Matthew’s text has σήμερον, Luke’s text has τὸ καθ’ ἡμέραν. Where Matthew’s text has τὰ ὀφειλήματα, Luke’s text has τὰς ἁμαρτίας. 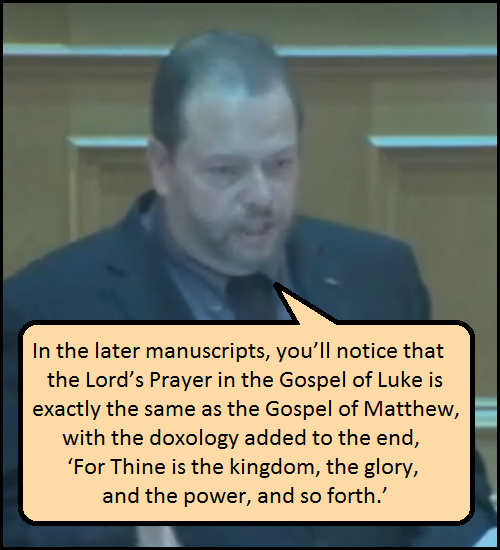 Where Matthew’s text has ὡς και, Luke’s text has και γὰρ. And – passing by some other differences – the Lord’s Prayer in Luke in the Byzantine Text does NOT have the doxology that appears in Matthew 6:13 in the Byzantine Text. ● Modern translations such as the ESV (which Costa called the Evangelical Standard Version; this was a joke, I think) do not really deny any important doctrines. ● Nobody is saying that all the Byzantine manuscripts agree perfectly; of course the Byzantine manuscripts are not 100% uniform. That does not say anything about the validity of the Majority Reading approach. ● About the note in Vaticanus: this supports exactly what Tors has been saying: although some scribes, on rare occasions, tried to alter the text, their efforts were opposed. ● Regarding Matthew 27:9: we see some scribes alter the text, but how many? A very small number, nowhere remotely close to a majority. This once again supports the view that the vast majority of scribes did not consciously alter their texts, and most people did not accept such rare alterations. ● It is not an ad hominem argument to call Griesbach a “rationalist.” That is an accurate assessment of his philosophy and of the basis for his text-critical assumptions: he valued what seemed reasonable, rather than what was tested and experienced. ● Is the majority always right? Not always; after all, Tors is advocating a view held by a minority of scholars. But showing that some majorities are wrong does nothing to show that the Majority Text approach is wrong. Tors then presented a map of the Byzantine Empire as it existed in the year 600. Revisiting Costa’s claims about why the Alexandrian Text disappeared, Tors points out that the Byzantine Empire included a huge swath of territory; it was not a localized corner of text-production. Against Costa’s claim that the Byzantine Text did not become the majority until the ninth century, when we look at the use of the Byzantine Text in this huge territory, we have to ask, if the Alexandrian Text was in the majority, why did the people in this area stop using it? Roman persecution ended in the 300’s; Christianity was the official religion of the Roman Empire by the 400’s – and we see the Byzantine Text used in the 400’s and 500’s. Why not the Alexandrian Text, if that was the majority? 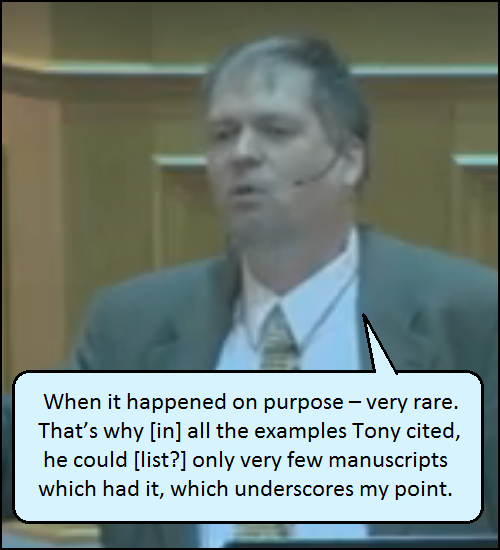 As Tors wrapped up this part of the debate, he once again stated that although the reasoned eclectic approach yields a text that contains errors, the Majority Reading approach yields a text that is inerrant. And it is the original inerrant text the textual critics should aim to reconstruct, even though God has shown that He is able to use imperfect compilations and even flawed translations such as the Vulgate. In this part of the debate, Costa presented practically no point for which Tors (even without taking advantage of Costa’s gaffes) did not have an effective answer. Tors did not, however, spend much time addressing Costa’s claim that it would be “dangerous” to apply the Majority Reading approach to the Old Testament text, probably because Tors never suggested doing so, and because the announced subject of the debate was not the Old Testament text. Somehow this soon drifted into the main current of the debate. Coming soon: Part 3: The Debaters Cross-Examine Each Other.